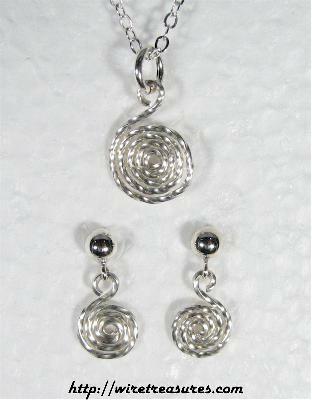 Simple curls make up this adorable pendant and earrings set made from Sterling Silver wire. Ball post earrings. This set includes an 18" SS chain. 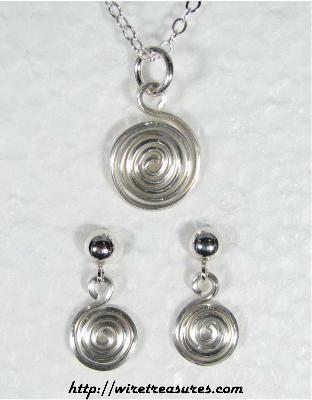 Also available with twisted wire; see additional photograph. This set would make a unique gift. It will arrive in a silver box ready for giving to that special someone, even if the special someone is you! Click on any image for a supersized view. Pendant bob is about 11/16-inch high and 7/16-inch wide; total earring length is about 3/4-inch and 13/32-inch wide. You are visitor number 5,096 to this page.